St Columba's: Operation STEAM Clean the Bay (Science, Tech, Engineering, Arts, Maths) aims to transform our landscape, curriculum and leadership projects – activating our community to care for the Bay, connect everyday decisions to Bay health and ultimately improve it. It is a 3 year project that started in July 2017 and will finish June 2020. 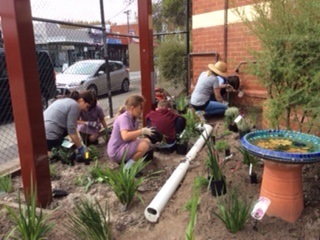 St Columba's Primary School - a 5Star ResourceSmart School is committed to advancing their community-wide sustainability leadership - is located in the seaside suburb of Elwood and wants to improve the current environmental health of Port Phillip Bay. Operation STEAM Clean the Bay (Science, Tech, Engineering, Arts, Maths) aims to transform their landscape, curriculum and leadership projects - making people think about and connect the health of the Bay to everyday life. Conducting community engagement activities including signage, artwork, community clean-up days, Climate Change Choir that all increase awareness of the Bay’s environmental health and value. Engaging with community engagement initiatives (educational signage, artwork, Climate Change Choir, media outreach). The sharing of project outcomes with other schools in Victoria via ResourceSmart Schools, and with the broader community through the Green Team blog. Operation STEAM Clean the Bay is funded through the Victorian Government's Port Phillip Bay Fund, is delivered by St Columba’s Primary School Elwood and is auspiced by Port Phillip EcoCentre.